"Field of Poppies" shows the flowers in full bloom, almost hovering in the foreground, with a tremendous backdrop of the sky behind. The sun is rising well off in the distance and has turned the sky a pale yellowish blue. It is one of Klimt's few landscapes to present a long perspective and deep horizon. 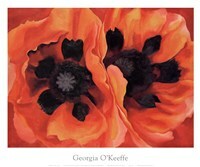 Indigenous to the Northern Hemisphere, the poppy generally has flowers with one per stem. In this exquisite work, the viewer sees the red flowers blooming all over the rolling hills with huge trees in the background. They are generally grown in red, orange, pink, and white and are, in fact, an edible flower. Growing between 4-6 petals, the red version of the flower has served as a symbol of the tragedy of all who died in World War I, as they are quite common in Europe.